Something akin to “peace” has come to the Underdark. The demon hordes have receded, and now the matron mothers argue over the fate of Drizzt Do’Urden. Even so, it becomes clear to one matriarch after another that while the renegade drow may come and go Menzoberranzan, the City of Spiders will crawl forever on. And so Drizzt is free to return to his home on the surface once again. Scores are settled as lives are cut short, yet other lives move on. For the lone drow there is only a single final quest: a search for peace, for family, for home—for the future. 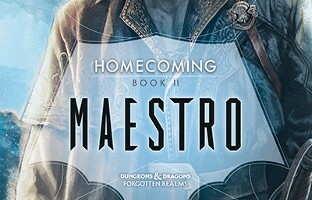 While I’ve been a fan of R.A. Salvatore’s books for as long as I can remember being a reader, I’ve been disappointed in the Drizzt books that have released over the last few years. 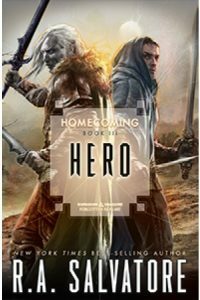 So I was glad to see Hero was getting such good reviews, it actually got me fairly excited to read the book. Sadly that excitement didn’t last all that long. 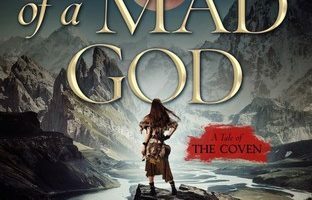 I actually loved it in the beginning, I was unable to put it down for at least the first third of the book, but then my progress slowed down to a slow crawl. It’s hard to say for sure just what I enjoyed so much in the beginning of this book that I didn’t find in the last two-thirds. 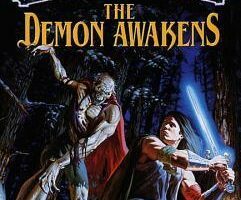 Part of the problem is probably how nostalgic these books always make me feel when I start reading them, the Drizzt books were some of my favorite fantasy books growing up, but nostalgia can only carry a story so far. The fact that Salvatore is such a great writer probably makes me judge these books a bit more harshly than I should — I know he has to write them to fit the Forgotten Realms stories but that shouldn’t detract from the story as much as I find it to. All that aside, I did finish the book and it was a decent enough conclusion to the trilogy and I’m sure I will read the next Drizzt book if and when it comes along next year. I would also recommend anyone new to the series start go back about 27 books or so and start from the very beginning, otherwise you’re going to be completely lost. Aw, it’s such a shame when an author you love doesn’t live up to his or her own standards. I quit reading Pratchett after Monstrous Regiment because I wanted to remember him for his best work, and the last ten or so Discworld books were just … not good. 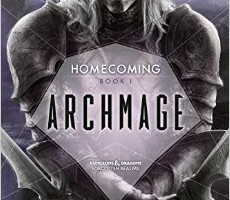 As a book blogger, do you feel like you have to continue a series even if you’ve been disappointed a few times in a row? I don’t feel like have to, but that I need to. I’m always hopeful it will get back to what I loved about the series.